The 2010-2011 CES in New Zealand’s South Island involved the rupture of at least 12 previously unknown faults in a series of Mw 7.1, 6.2, 6.0 and 5.9 earthquakes over 16 months (Figure 1). 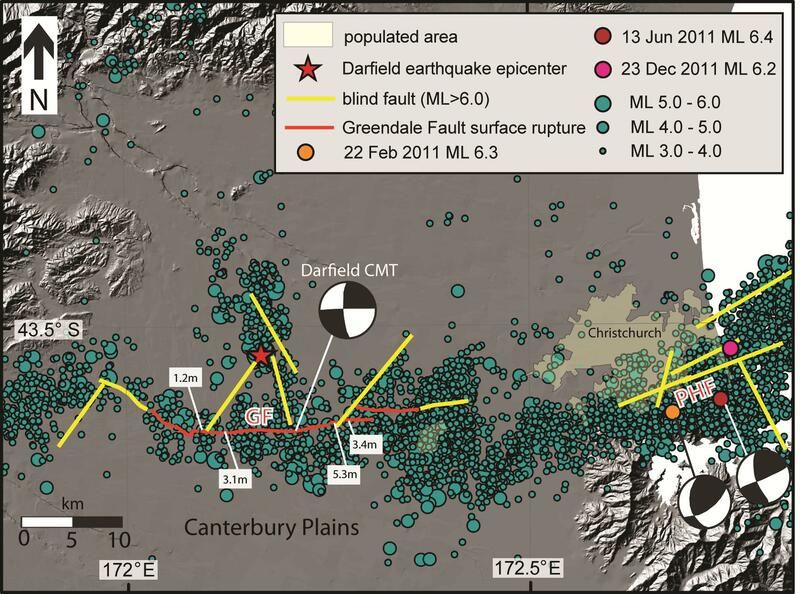 The Canterbury Plains immediately to the east of Christchurch, where the fault system hosting the Mw 7.1 earthquake lay undetected, had been subjected to scientific study for several decades, including seismic reflection surveys of active faults. 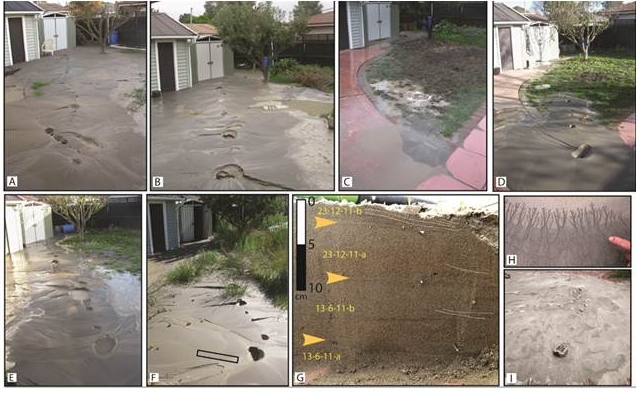 The 2011 Mw 6.2 Christchurch earthquake that occurred during this sequence caused 185 fatalities when a blind fault ruptured beneath the city and generated peak ground accelerations in excess of 0.4-0.6 g horizontally and 1 g vertically in central and eastern Christchurch (Figure 1). Such an earthquake sequence could occur at any location on the planet, and if it was to occur beneath a highly populated city lacking the quality infrastructure and building codes of New Zealand, the number of expected fatalities could be in the hundreds of thousands or even exceed one million. Although the specific location of the CES faults was unknown, their presence as unidentified ‘floating’ sources of Mw max 7.2 was accounted for in the New Zealand seismic hazard model3. It is essential to understand how these types of scenarios are manifested in the geologic record, and thus how they should contribute to seismic hazard assessments. 1. Surface rupture in major (≥Mw 7.0) earthquakes as manifested by discrete fractures may record as little as one third of the total surface displacement and one half of the subsurface rupture length (Figure 3a). This will vary widely depending on the properties and spatial distribution of the faulted material and the slip on the fault. However, because of the way earthquake ruptures have traditionally been mapped, the amount of maximum and average slip on discrete structures can be used with existing empirical relationships to reliably estimate the Mw of the earthquake source. 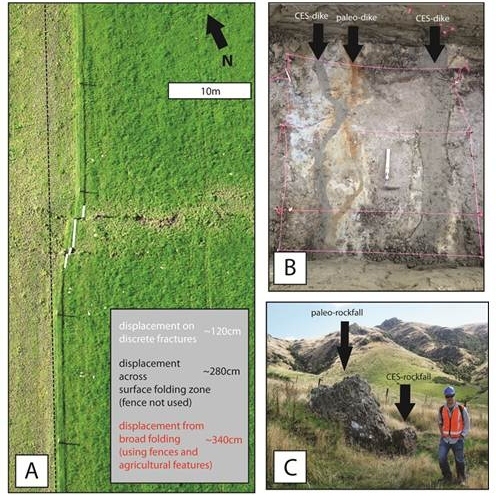 The Greendale Fault that ruptured in the Darfield earthquake produced a 29.5 ± 0.5 km long surface rupture7 across a low relief Late Pleistocene alluvial plain. Fencelines, roads, crop rows, and other linear features allowed us to document coseismic displacements across the fault zone with high precision, even where evidence of discrete surface fracturing was not present. Maximum dextral displacements exceeded 5.2 meters and maximum vertical displacements exceeded 1.5 metres, and average net displacements along the fault length were 2.5 m7. GF surface deformation was typically characterized by a ~50-150 m wide zone of distributed folding with an internal zone of discrete surface fracturing that ranges in width from 5 to 50 m (Figure 3a). 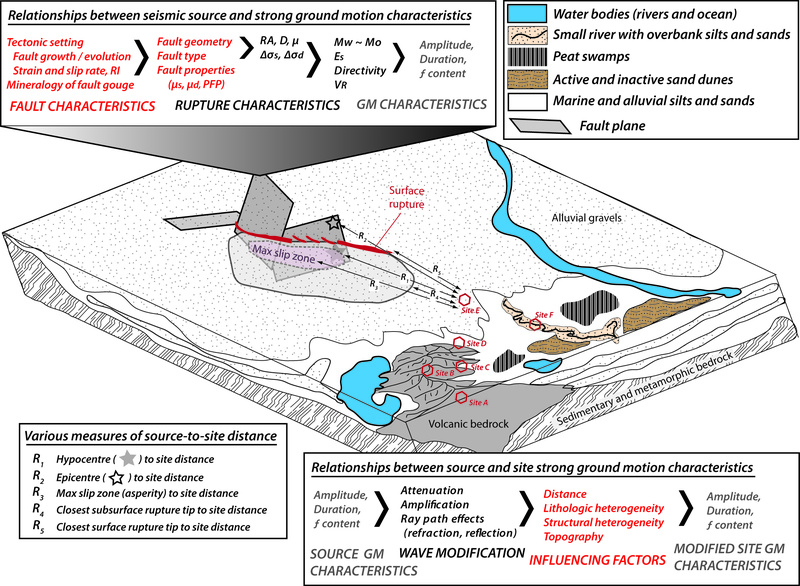 Only ~20 km of the surface rupture length (SRL) was associated with discrete surface fracture, and discrete surface fractures only accommodated about one third of the total displacement. The subsurface length of the GF exceeds 40 km. Without anthropogenic markers much of the deformation on the GF would have gone unrecognized. If we use the measured SRL with scaling relationships8 to estimate the Mw of the earthquake, as would typically be conducted for a paleoseismic analysis of a prehistoric fault rupture, we derive Mw ~6.8 for the total SRL and Mw ~6.6 for the portion of the fault with discrete surface fracturing. Conversely, using empirical scaling relationships with our measured displacements, we derive an estimate of ~Mw 7.4. However, if we consider only the displacements associated with discrete fracturing, we derive estimates of Mw 7.0, which is consistent with seismologic and geodetic data for this seismic source. So faults deform much more of the surface then we might recognize from the geologic record, particularly in sediment, but we can deduce meaningful information about the likely earthquake magnitude from preserved displacements on discrete fractures, even for faults with long earthquake recurrence intervals. For this reason, it is important to provide measurements of both surface fracturing displacement and broader surface deformation for earthquakes in the modern era, so that the former can be used to maintain consistency with existing scaling relationships. This will maintain clarity in these relationships, and inform how to interpret prehistoric ruptures, where localized deformation on discrete fractures is typically the only displacement that can be confidentially measured. I am deeply indebted to my wonderful group of postgraduate students, particularly Brendan Duffy, Timothy Stahl, Eric Bilderback, Narges Khajavi, Sarah Bastin, Gregory De Pascale, Sharon Hornblow, and Peri Sasnett for their monumental and inspiring efforts to convert earthquake trauma into scientific legacy. My understanding of earthquakes has profited immensely from discussions with Jarg Pettinga, Kevin Furlong, Brendon Bradley, Russ van Dissen, Andy Nicol, Pilar Villamor, Russell Green, Martitia Tuttle, Sandy Steacy, Yong-Gang Li, and John Beavan, amongst many others. What a great read! Exactly what we are talking about in my geohazards class! I am excited to read Quigley’s entire paper! All 40+ pages. Very useful read, has increased my understanding of this earthquake that has decided my future career path. I do agree with Jon though, the abbreviations for Greendale Fault (GF) & Canterbury/Christchurch Earthquake Sequence (CES) did mean I had to think about what they might stand for. re lived it as I read it !! well done ….. I hope its all over now !! Very nice paper! Thanks for this contribution. Thanks a lot for this great article! Do you think your findings make it necessary to update the ESI2007 scale? An index of abbreviations and glossary of terms would help (my) understanding – my geology is getting a little rusty!